Pictured above is an artist's rendering of the education and research community envisioned by University Associates for the NASA Research Park at Moffett Field. Image courtesy of University Associates. The University of California, Santa Cruz, and Foothill-De Anza Community College District today announced a dynamic new partnership with NASA Ames Research Center to establish a sustainable community for education and research at the NASA Research Park at Moffett Field. UCSC and Foothill-De Anza have formed a nonprofit entity called University Associates - Silicon Valley LLC, which signed a lease with NASA in December for 75 acres of land in the NASA Research Park. 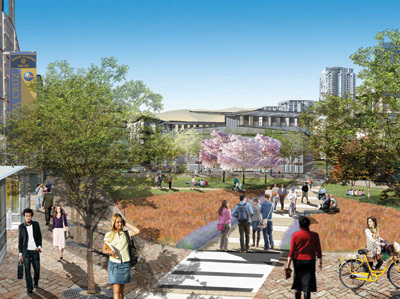 The goal of the partnership is to create a prototype for an environmentally sustainable community and contribute to the economic vitality of the region, while providing a unique collaborative environment in which to deliver innovative education and research, said UCSC chancellor George Blumenthal. "Our vision is to seed innovation, entrepreneurship, and sustainability through the creative reuse of an important public asset for regional benefit. We aim to establish world-class programs and facilities dedicated to preparing the workforce of the future and to conducting research at the forefront of science and technology," Blumenthal said. Martha Kanter, chancellor of Foothill-De Anza, said, "Being part of this unique education and research community would give Foothill-De Anza students new opportunities to learn in a world-class research environment. It opens up exciting possibilities for preparing our students to enter Silicon Valley's clean-tech green-tech workforce or pursue advanced study in science, technology, engineering, and emerging career fields." Carnegie Mellon University, Santa Clara University, and San Jose State University have also been involved in the planning and may eventually join the partnership, said Joseph Miller, UCSC's vice provost for Silicon Valley Initiatives. "We expect other academic institutions, including representatives of the California State University system, will join the partnership to take advantage of this unique opportunity," Miller said. "We have secured a long-term lease agreement on a choice location in the heart of Silicon Valley, adjacent to NASA Ames and the most innovative companies in the world. We will be creating a new green community and working together to tackle some of the most pressing problems facing our society." This vision includes an integrated community featuring state-of-the-art research and teaching laboratories, shared classrooms, housing, accommodations for industrial partners, and modern infrastructure. Joint academic initiatives are planned in science, engineering, and management to keep Silicon Valley at the forefront of innovation and technology leadership. The community will be designed to have a minimal carbon footprint and will serve as a model site to deploy and validate new renewable-energy and resource-conservation systems. As a real-world setting for studying and testing potential solutions, it will provide an invaluable resource for faculty engaged in sustainability research and teaching programs at UCSC and other partner institutions. For students, the collaboration will offer joint academic programs that draw upon the talents and expertise of each partner institution. "Being part of the University Associates presents new opportunities for our district to create accelerated programs of study with our partner universities," Kanter said. The project supports the missions of NASA. NASA's goal is to establish the NASA Research Park (NRP) as a shared-use R&D and education campus for collaborations among government, industry, academia, and nonprofit organizations. More than 50 industry, university and nonprofit organizations are already located in the NRP, supporting NASA's mission in three areas: advancing NASA's research leadership; facilitating science and technology education; and creating a unique community of researchers, students and educators. Students attending the new campus will provide a source of future employees to strengthen NASA's workforce and help the agency achieve its exploration objectives. UCSC has led the planning for this innovative collaboration, which builds on the campus's highly successful existing partnerships with NASA Ames, such as the University Affiliated Research Center (UARC) and the Advanced Studies Laboratories (ASL). Local congressmembers--including U.S. Representatives Anna Eshoo, Mike Honda, Zoe Lofgren and others--provided valuable support for the lease agreement with NASA, Miller said. "We are extremely grateful for the strong support from local leaders, which was vitally important to our success in moving this forward," he said. The next critical step for the partnership is to undertake thorough evaluation and planning studies in accordance with the California Environmental Quality Act (CEQA), said William Berry, newly named president of University Associates. University Associates is engaged in ongoing efforts to obtain community input and to determine how best to ensure that any development addresses community needs and is effectively integrated into the surrounding cities. Development of the site would be undertaken through a public-private partnership. University Associates plans to select and oversee a "master developer," who would attract the external capital investment required to complete the project, which is expected to cost more than $1 billion. The property will remain in federal ownership, with University Associates and the master developer responsible for managing and developing the site. The timeline for the development depends on multiple factors, including CEQA compliance, the financial climate, market demands, and potential partnerships with industry. Work on the site could begin as early as 2013, with initial occupancy as early as 2015. For more information about this project, visit www.deliveringthefuture.org.